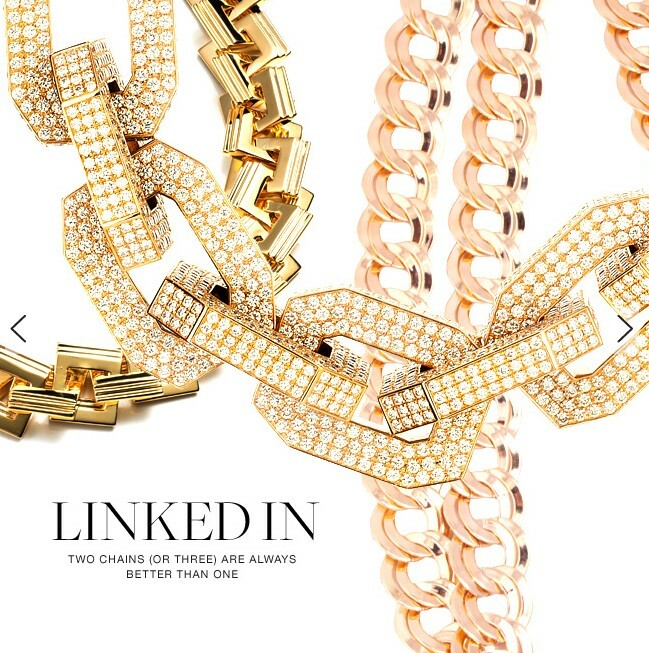 LINKED IN with layers of chains. Bold and beautiful. These powerful pieces of perfection dominate the room and show all around that style, like these chains themselves, can take on many personalities. Gone are the days where brazen, bare chested mafia men had a patent on chain necklaces and hairy chests! Keep the hair Don Corleone! What we want is a renaissance for these glamorous pieces. Roaring out of 2012 and into 2013, the chain necklace is simply stylish and natural. But if one isn’t enough, why not accessorise with yet another chain necklace that showcases something different and modern, diamonds, a new pattern or a different shade of gold. Reinvent your evening gown with two or more chains that will do all of the talking. While the words ‘bold’ and ‘beautiful’ might bring you images of tacky monologues and Botox injections, do not be mistaken, these items speak sincerity and glamour.